When you look back on your special day in many years to come, do you want to remember incredible food at your wedding breakfast? A wedding is probably the biggest and most important event you will ever have to organise and we understand how important it is to pull out all the stops when it comes to the food. We specialise in the art and theatrics of cooking using fire and smoke. We cook and serve authentic, locally-sourced and seasonal dishes all cooked over real fire. Whether it’s whole salmons seasoned and cooked to perfection in our fire oven, or melt-on-your mouth meat roasted slowly over smouldering wood, we have a proven track record of delivering unforgettable experiences. Our team will bring your succulent dishes cooked by a team of talented chefs straight from fires. Hello and welcome to With Fire. 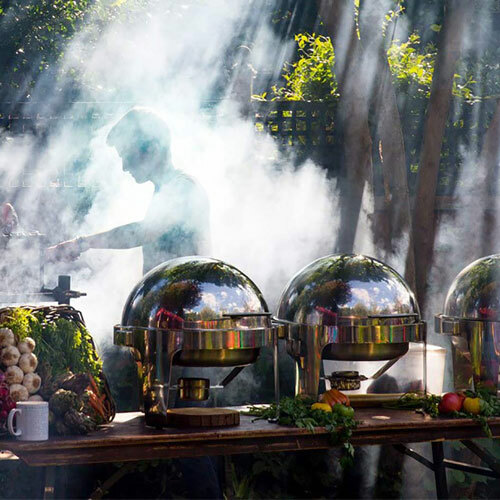 We are expert BBQ and gourmet caterers, specialising in the art of cooking using fire and smoke for weddings, private parties and all types of special events in London and the surrounding areas. We provide superb food using fresh and wholesome ingredients, all cooked over a real fire. 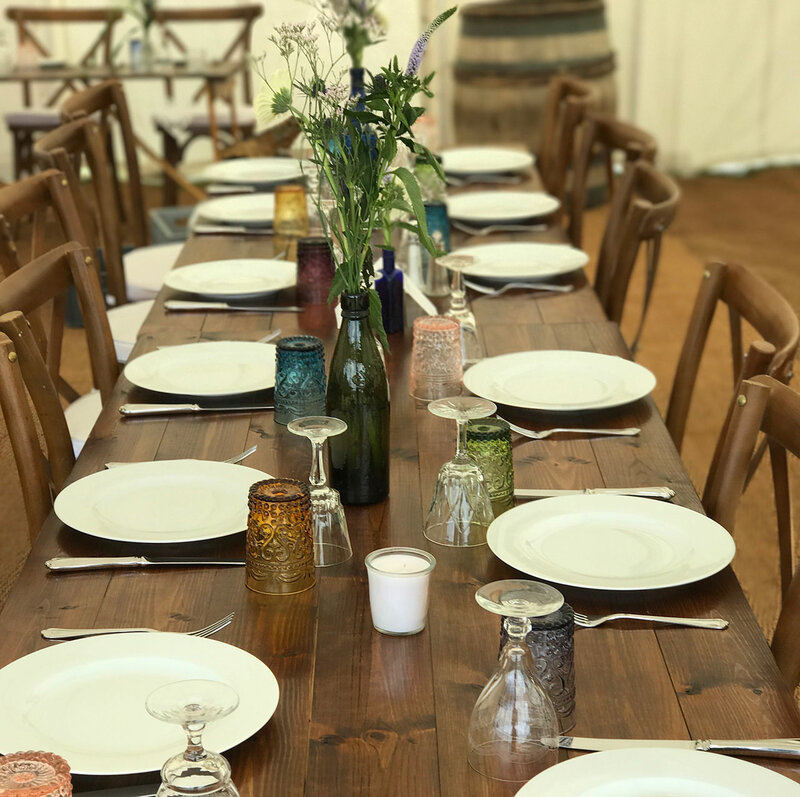 Our team have over 50 years’ experience between them and can cater for every type of occasion, from weddings and private parties, through to large corporate events. We will work closely with you to provide exciting and delicious food, ensuring we always exceed your expectations. Rather than providing restrictive menus, we work with our clients to come up with bespoke menus to perfectly suit their event. Whether you know exactly what you want, or you need an expert guide to offer advice and ideas, we are here to give your event a unique twist. Our team have catered for hundreds of events over the years and we understand that the food and catering can make a big impression. 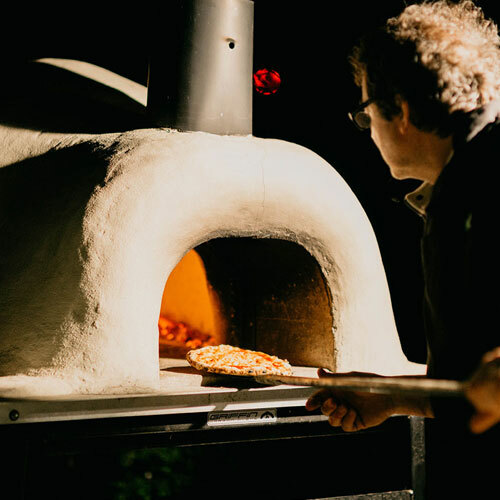 Whether it’s locally-sourced meat roasted slowly over smouldering wood or authentic Neopolitan-style pizzas cooked in one of our portable wood-fired ovens, we will create an unforgettable food experience for your guests. We are always happy to sit down and discuss ideas with you and offer you a completely free of charge and no-obligation quote. 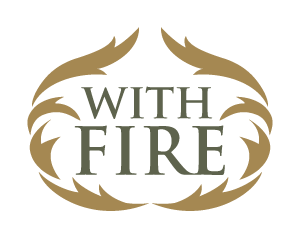 To discuss your BBQ catering ideas, wedding BBQ or to ask any other question, please email info@withfire.co.uk or fill out an online enquiry form and we will get back to you as quickly as we can. Book your wedding catering or a wedding BBQ in London with us! Congratulations! You and getting married and now you can organise the fun part – the wedding catering! After all, what can be more exciting than thinking of all your favourite foods and putting them together to form a fantastic menu for your guests on your Big Day? We always feel privileged to be part of a couple’s celebration and aim to go above and beyond when it comes to providing you with truly wonderful food. Everyone loves a good wedding and having a good meal will be central to your celebration. The traditional three-course meal is not always what every newly married couple is looking for on their Big Day and we know that your menu should reflect the venue and style of your wedding. We think it’s really important to have the food you want and we can provide you with a unique seasonal menu or wedding BBQ of your dreams. 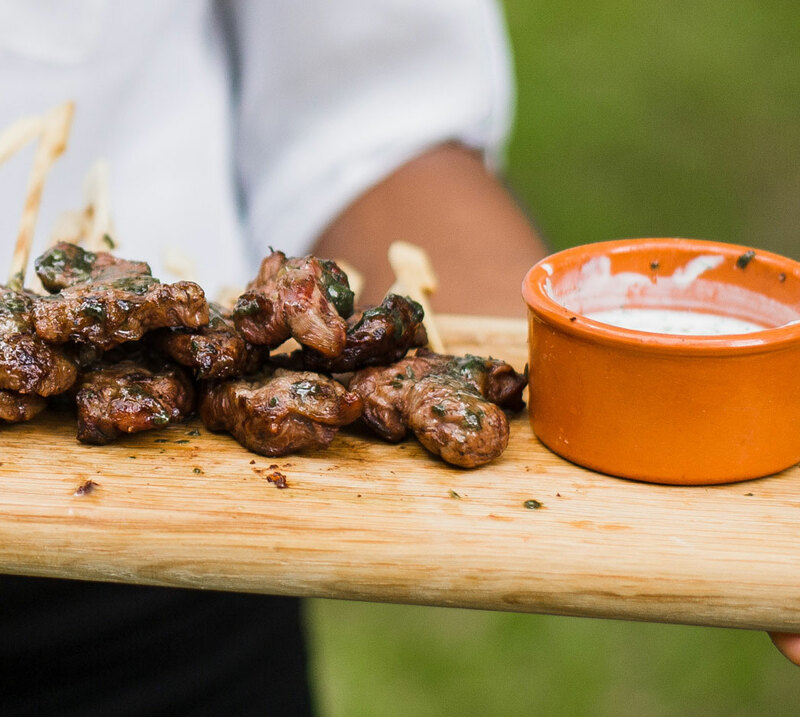 BBQ wedding catering is hugely versatile, so whether you are hoping to organise a mouth-watering sit-down meal for 50 people or delicious and filling bowl food and canapes for 500 wedding guests, we will create a menu that everyone enjoys and remembers. Options also include wood-fired hog roasts and BBQs, woodfired pizzas, or even bespoke Indian, Thai or Mexican woodfired dishes. Rest assured that when you choose With Fire, you guests will leave one of the most important days of life as happy as you are. Whether you are having a private birthday party for a small number of guests in your home, or you are organising a corporate event for thousands of people, our team will make your event one to remember! BBQ: When you think of a BBQ, do you think about burnt sausages and charred chicken drumsticks? Think again! Locally-sourced, organic meat forms the centre of our bespoke BBQs, where guests can enjoy the theatre of cooking meat over fire. Whether you are looking for a unique Asian BBQ, serving meat seasoned in incredible herbs and spices or an American slow & low BBQ, our team can cater for you. 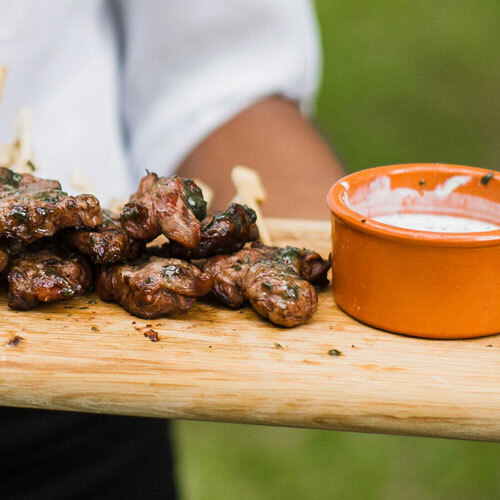 If you are considering a wedding BBQ, perhaps whole chickens spinning over the fire or a whole lamb being cooked Asado-style, will provide an incredible visual (and well as edible) feast! Pizzas: Let us cook pizzas in wood-fired ovens before your very eyes! It takes just 90 seconds and guests can choose their own toppings and watch as the pizza bakes to perfection. If you are thinking about a street food stall, our pizzas make a fantastic option because they do not require formal seating. Canapes and bowl food: If you are not after a sit-down meal, bowl food and canapes are always a popular choice. With Fire takes this option to a whole new level, with guests able to enjoy watching their food being cooked over a live fire. Are you looking for BBQ catering, gourmet BBQ or event catering in London? Call us for a quote! 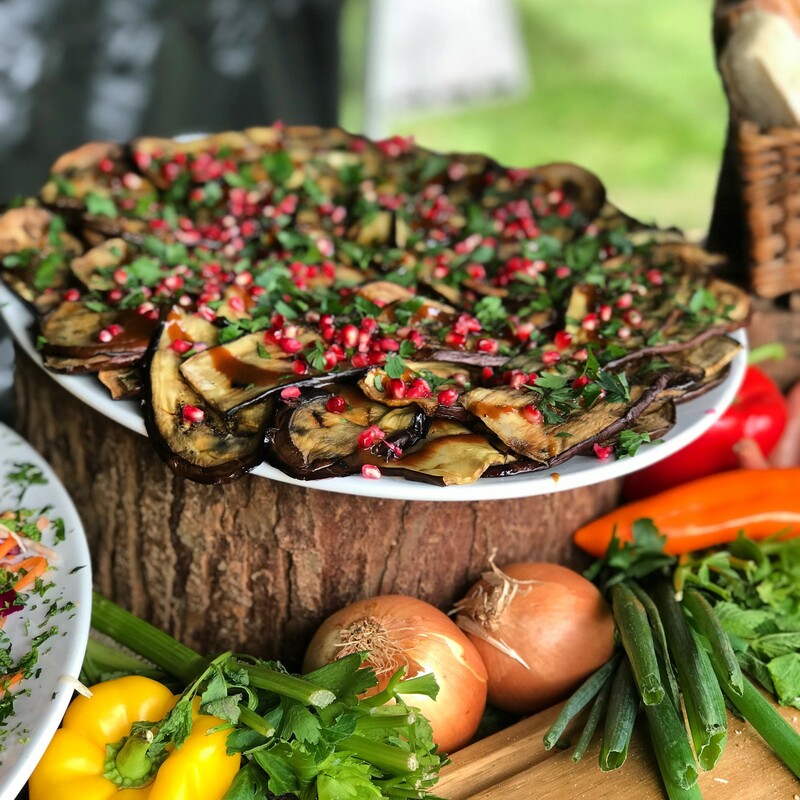 For more details about our unique BBQ food and cooking with fire, please email info@withfire.co.uk or fill our an online contact form and we will give you a call.